Griffin's artwork, his technique and his teachings helped to develop and expand the potential of printmaking, especially linocuts, in Victoria. His skilful use of line and colour was imparted to his many students in his long held position as Drawing Instructor at Melbourne Technical College. While Griffin was best known for his remarkable linocuts, he regarded himself first and foremost as a painter. His concern was to capture the essence of the landscape, rather than a geographical or tonally accurate scene. 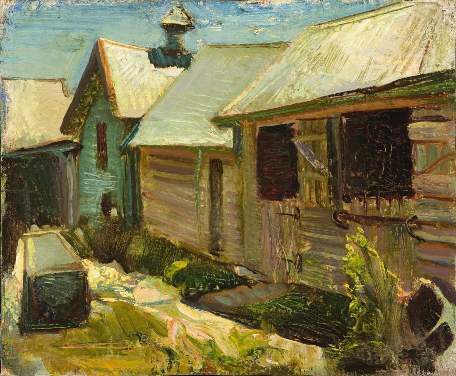 Griffin spent the majority of his life in the Heidelberg area including the Yarra River and its surrounding river flats, continuing the tradition of plein-air painting as made famous by preceding artists such as Roberts and Streeton. He also spent the summer holidays around Mansfield in north eastern Victoria. 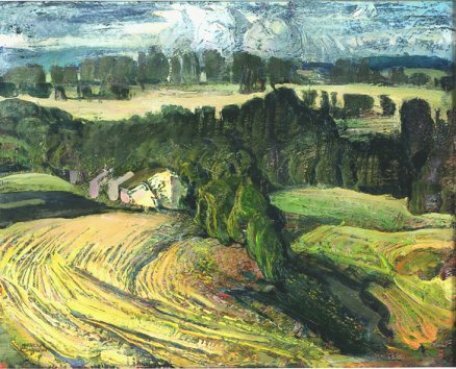 These areas provided much loved sources of inspiration for his landscapes. A unique and important contributor to the Melbourne art scene, Griffin was highly regarded and praised in his own time but had received limited critical attention in recent years. Exhibiting his paintings from the mid 1920s onwards, Griffin rapidly built up a reputation for his inspired visions of the Australian landscape. This artistic activity was interrupted when, in 1941, Griffin was appointed official war artist. Sent to Malaya, he was captured at the fall of Singapore and spent the next three and a half years in the notorious Changi prisoner-of-war camp. ' he worked relentlessly to record the day-to-day activities and great ingenuity with which the prisoners managed to survive the appalling conditions'. In the 1960s Griffin's artistic output took a dramatic turn. Although he continued to produce a variety of works into the 1970s, his attention was largely directed towards expressing his deep commitment to Anthroposophy, the spiritual teachings of German philosopher Rudolf Steiner'. Despite regular exhibitions during his lifetime, Griffin has not yet received the recognition his contribution to Australian art warrants. His early ability to cater to conservative tastes for realistic images as well as to modernist design trends has resulted in him slipping between the cracks of Australian art history. This has been exacerbated by his solitary working practice. Critical examination has also been clouded by his single-minded devotion to Anthroposophy in later years. A careful reappraisal of his life's work is overdue. ' Hi paintings, which have received minimal attention, are uniquely poetic and joyous visions of his beloved Australian landscape.